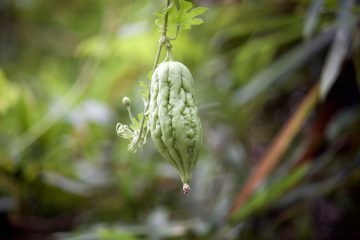 Bitter gourd isn’t just a vegetable–it can be medicine, too. Like many people, my favorite pastime is gardening. It is my relief from stress and source of joy, especially when it’s harvest time. These days, I am growing organic ampalaya in my backyard. It is also called bitter melon or papailla. 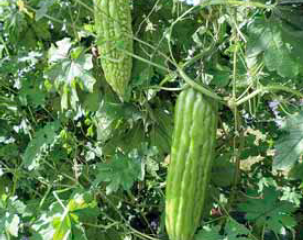 Its scientific name is Momordica charantia. I enjoy sharing my harvest with my friends and neighbors. I also like to impart my little knowledge about it. 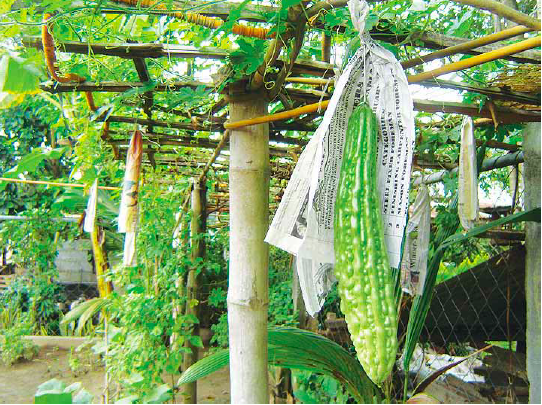 I suggest to those who plan to grow ampalaya in the backyard to plant it in an area that is exposed to sunlight. They should also plant the crop near a compost pit. Eight months after the biodegradable waste decomposes, sow two seeds near the pit. As soon as the vines start growing and crawling up the trellis, water the plant with rice, fish, or meat wash from the kitchen. This is best for the plants as these washes are very rich in nutrients and minerals. To prevent pest infestation, bag the fruits with cellophane or old newsprint as soon as the flowers fall off. Doing so will hinder sucking insects and fruit flies from laying eggs in the young fruits. I also inspect my ampalaya plants every morning to see if there are tiny holes or scratches on the leaves. These are indications that the plants are infested by pin worms or cutworms, which I remove manually. I also suggest that biodegradable waste be burned under the trellis in the early morning or late afternoon, as the smoke will drive insects away. I grow the native variety as it is resistant to pests. It is shorter than other cultivars but it has a thicker pulp. I start to harvest 45 days after planting, and for about 90 days from the first harvest, I pick one to two fruits every other day. My family often cooks pinakbet or ampalaya with egg; we don’t mind its bitter taste as we know ampalaya contains momordicin, a compound found to be effective in treating diabetes. 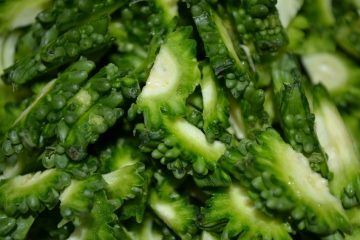 • Wash and finely chop ampalaya leaves. • Add six tablespoons of the chopped leaves in two glasses of water. • Boil the mixture for 15 minutes in an uncovered pot. • Cool down and strain. Incidentally, the standard treatment for controlling type 2 diabetes includes diet, exercise, and anti-diabetic medications. Hence, regular intake of ampalaya alone will not be sufficient for controlling the blood sugar of most diabetics. People with the disease must still exercise and stick to a diabetic diet. Furthermore, many diabetics will still require medicines; the regular intake of ampalaya will, at the least, lower the dose requirements for other anti-diabetic drugs. 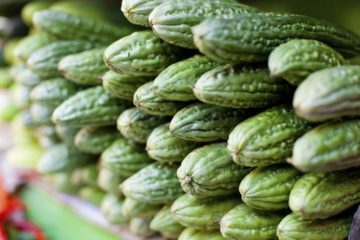 The blood sugar lowering property of ampalaya is attributed to its momordicin content, a substance that is sometimes called plant insulin. This is also the substance that is responsible for the bitter taste of the plant’s leaves and fruits. 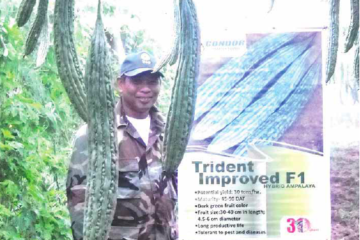 As for the other medicinal properties of ampalaya, books and articles on Philippine medicinal plants list several diseases in which the use of the plant appears to be beneficial. Reportedly, extracts from the leaves or roots shrink hemorrhoids. The leaf extract is supposedly also a good antitussive (i.e., anti-cough) and antipyretic (i.e., for fever). Likewise, it is purportedly, a good purgative. 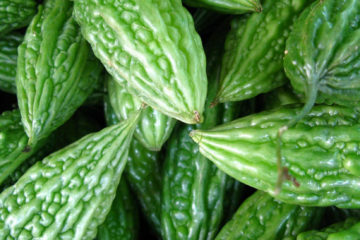 Clinical studies for ampalaya or bitter melon demonstrated hypoglycemic properties (blood sugar lowering) or other actions of potential benefit against diabetes mellitus. The leaves and fruits are excellent sources of Vitamin B, iron, calcium, and phosphorus. It is also rich in beta carotene. So try this, growing organically in your backyard. It’s simple; all you need is a little time and effort.